In recent days, we again saw the deadly toll of distracted driving on our highways. A church choir in Texas was returning from its annual retreat when the unthinkable happened. A pickup truck suddenly veered from its lane and into the path of their bus. The two vehicles collided head-on. According to news reports, thirteen senior citizens from the same church died in the crash. One church member survived the crash itself but currently remains in critical condition from her injuries. The photographs and video of the crash scene are difficult to view. The vehicles look like mangled pieces of steel destroyed by the impact. But, this was not an accident. It was avoidable. The pickup truck driver chose to disregard completely the safety of others and caused the deadly crash. What choice did this driver make? He chose to drive distracted for miles down the highway putting many lives in danger. He chose to put his attention on texting instead of the roadway. Distracted driving leaves a path of destruction across the highways of Alabama and all other states. In Alabama, we recently saw a driver receive jail time for a deadly distracted driving crash. In Georgia, a commercial truck driver plowed into a car of nursing students causing another deadly crash. Our roads and cars are much safer than twenty years ago. So, why are personal injuries and deaths on our roads now increasing? Distracted driving. Distracted driving is the common factor in the increasing number of deadly crashes. In my personal injury law practice, I deal with the results of distracted driving on a daily basis. We have all seen drivers weaving across the road while staring at a cellphone. I’ve looked at vehicles beside me on the highway and have seen the other driver more engaged with his or her cellphone than the road. I’m sure many people can relate a similar experience. I often see both drivers and pedestrians staring at their cellphones instead of watching where they are going. Their choice of focus creates tremendous dangers. 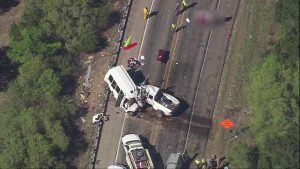 Investigators continue to learn more about the deadly Texas bus crash. A witness to the crash has revealed very troubling details. This witness followed the distracted driver on the highway before the crash. He saw the distracted driver weave left and right across the highway for miles. He called law enforcement to report the dangerous driver. When this witness rushed to the scene to help the victims following the crash, what did the distracted driver say? According to the witness, the distracted truck driver said “I’m sorry, I’m sorry. I was texting.” That admission of wrong came too late for the people hurt or killed. The bus crash witness tells a troubling story. We don’t have just his words. His passenger also videoed the weaving driver. You can see the distracted truck driver. And, you can hear the witness seek law enforcement help. Why would anyone drive for miles weaving across a highway while texting? At the Blackwell Law Firm, we help the victims of distracted driving recover their damages. We also advocate for highway safety. You can read numerous articles we’ve written on distracted driving and ways to eliminate its deadly toll. Our articles stress both education and technology as ways to reduce the danger.